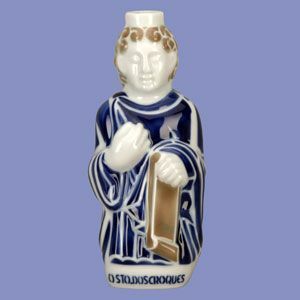 Many will recognise the design of Sargadelos ceramics, since throughout its more than 200 years of history it has become not only a typical Galician souvenir but also a symbol of Galician identity and culture. But how did this well-known brand started? 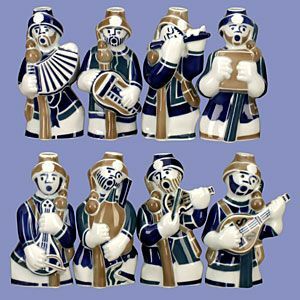 Its origins go back to the beginning of the 19th century due to the illustrated initiative of Antonio Raimundo Ibáñez, who founded the first ceramic factory in Galicia in 1806, during the First Industrial Revolution in Spain. 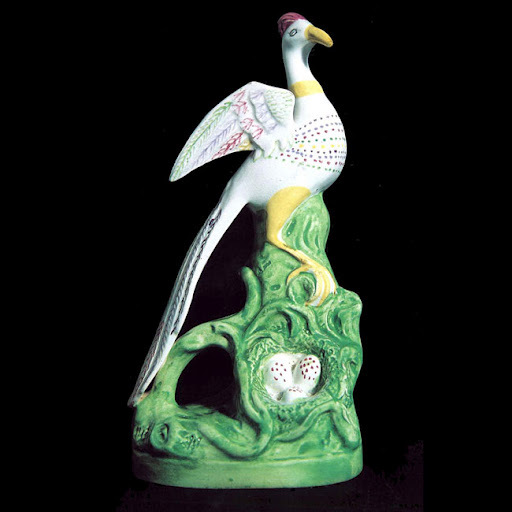 The project allowed Raimundo Ibáñez to develop his refined taste for the Plastic Arts at the same time as taking advantage of the market opportunity caused by the cessation of imports of English "Bristol" ceramics. In favor of this initiative, he already had part of his steel infrastructure and, above all, the outstanding quality of the deposits of kaolins existing in the surroundings of Sargadelos, helped to make this possible. 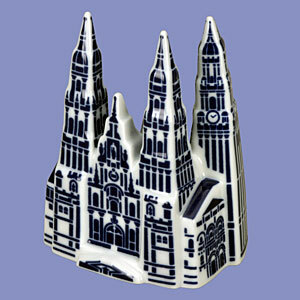 Due to this cessation of British ceramic imports, the designs of this early period were white with bright enamel, inspired by Bristol English pottery and hand-painted. 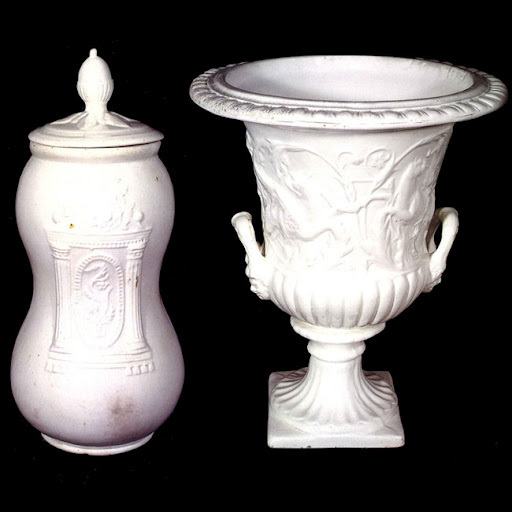 They mainly stand out the plates and vases designed in this neoclassical style. Around 1835, they opted for the first printing and polychrome tests, and the tableware and many other pieces such as clocks and candelabras (often of neo-Gothic inspiration) continued to appear in white, as well as the plates with mythological or religious motifs. Towards 1838 it was when a change in the production began; The first prints with popular Galician themes were made and some tableware with German flower stamping began to emerge. A decade later approximately, in 1845, Luis de la Riva y Cía, of Santiago de Compostela, leased the administration of Sargadelos to the Ibáñez family. In that year begins its period of greater splendor, reaching a higher quality and developing new varieties of tableware. The so-called opaque chinese ceramic was introduced in this stage, decorated with floral patterns stamped in sepia and chestnut and painted with brush in shades of green, blue, yellow and pink. However, in 1862 the management of the company returned to the Ibáñez, and thereafter suffered a great decline caused by family disputes, until its closure in 1875. Despite this, the impact left in society allowed the recovery of his legacy in 1949, through the project of economic and cultural recovery of Galicia led by Diaz Pardo and Luis Seoane, characters of great relevance within the Galician culture. The old factory of Cervo (Lugo) was recovered in 1968 and the ceramic society of Sargadelos was constituted. In this new stage, the brand becomes, through its artistic quality and innovative designs, an iconic reference for all of Galicia. 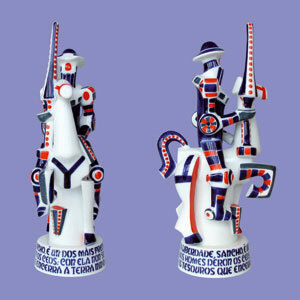 Importance was given to classical forms, but also incorporating new avant-garde forms designed by Luis Seoane. Of particular interest were the portraits of famous characters of literature and art or even medieval characters such as the Maestro Mateo, the bishop Gelmírez or the popular galician heroine, María Pita. 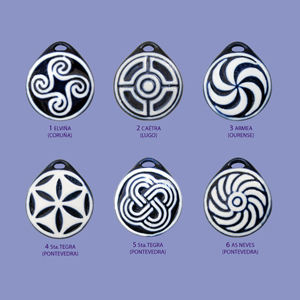 Nowadays, the most often and popular designs are those abstract-geometric motifs taken from Galician Romanesque and Baroque, or the forms that, in some way, have a parallelism with the formal symbolism of this Romanesque art, very present in this region.